I arrived at Bentley Wood to find the car park packed, not only with cars, but with people gazing upwards. The nearest chap whispered in hushed tones that we were in the presence of ‘His Majesty’ the Purple Emporer Apatura iris. A first for me. An elusive, almost mythical butterfly that until then I’d only read and dreamt about. I hadn’t imagined for one moment that one day I’d simply step out of my car and find it waiting for me. If I’d known, I would have had it cleaned and valeted. You can look at any number of photos and illustrations but nothing quite prepares you for the moment you see this regal butterfly in the wild. He really is quite magnificent. Now I’d love to say I went on to get some cracking photos of his majesty, but my macro lens was of little use here and feeling outgunned by the 500mm brigade I went looking for more suitable quarry. Entering a sunny glade I soon had another first. A large patch of pink and white flowering bramble had attracted half a dozen Silver-washed Fritillaries Argynnis paphia, which are distinguishable from the similar looking Dark Green Fritillary by their larger size, differently marked underwings and their preference for woodland habitat. I managed to get just one rather indifferent image, yet it caught the underwing detail which later confirmed the identification. My lasting impression though is of hot orange and silver floating silently in and out of the dappled light and shade. Quite superb, magical really. Then another. 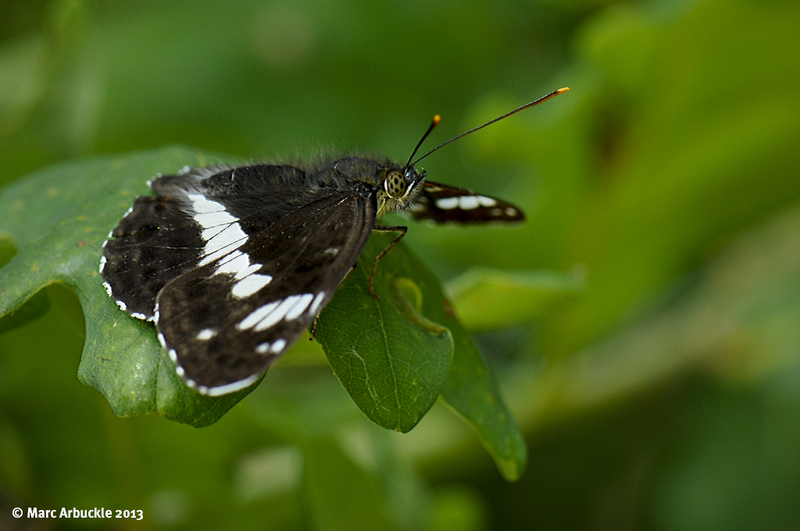 A momentary flash of black and white this time, the White Admiral Limenitis camilla. Smaller and much prettier than I had imagined. I spent a pleasant hour watching this handsome male defend his territory against all comers. It was well chosen too because his dark green oak had fragrant red and yellow, female-attracting, nectar-rich honeysuckle running through its branches. Honeysuckle that she will eventually lay her eggs in and their offspring will feed on. A prize worth fighting for. Between bouts this black and white pugilist would occasionally glide down to rest on one of the lower branches which eventually gave me the opportunity to get this shot. Look at that fantastic big spotty eye. Congratulations on your audience with the Emperor! 😀 Stunning shot of the white admiral too, that eye is amazing! Thanks Lucy. I was honoured indeed. I saw 6 in total. Will try and get some photos at the weekend.